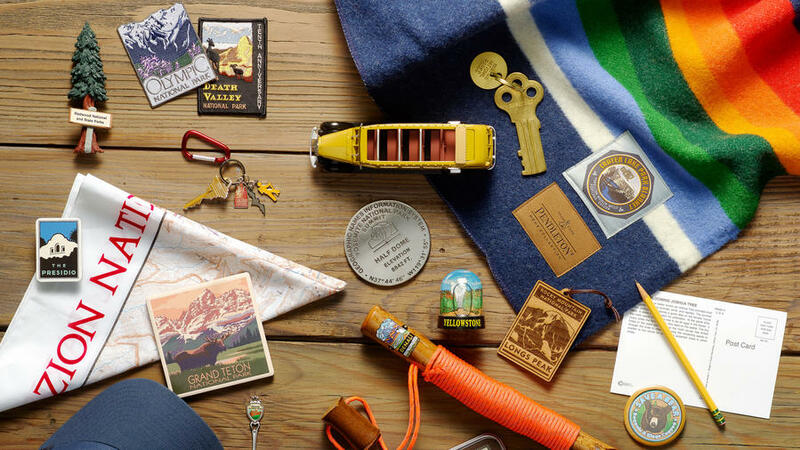 If you’re among the hundreds of thousands heading to a national park this summer, chances are good you’ll pick up a souvenir patch or kitschy snow globe to seal the memories for a lifetime. In addition to ogling the marquee attractions, like the Teton Range or Old Faithful, you’ll also find a slew of trails and educational programs to make the experience even more bucket list–worthy. Denali hiking stick medallion, $5.95; . Grand Teton ceramic coasters, $20; . The Presidio magnet, $5.95; . Redwood 3-D magnet, $8.99; . Carlsbad Caverns charm key­chain, $5.99; . Crater Lake Pendleton blanket, from $199; . Joshua Tree postcard, from $1.75; . Longs Peak wooden ornament, $9.95; . Grand Canyon collector’s spoon, vintage. Zion map bandana, $7.99; . Fun fact: The most popular destination in the national-parks network is in a major city—the . Stop in the park’s just-opened , housed in a rehabilitated guardhouse from 1900, for spectacular views of the bay and interactive exhibits that explore the historic military post. You can also get insider tips about what to see in the Presidio and the rest of the Golden Gate National Recreation Area. Home to the highest summit in North America, in Alaska celebrates its by unveiling a newly restored 1927 cabin, originally built by the park’s first superintendent. In August, the tundra is packed with wild blueberries and cranberries ripe for picking (but be ready to share them with grizzlies stocking up for hibernation). Don’t miss the wildlife tours, either: Moose with full racks, wolves, and caribou are all out and about, taking advantage of Alaska’s long summer days. Walk down our new favorite paved trail in to the shore for overlooks that will make you gasp. Switchbacks along the moderate 0.5-mile hike to the roaring 100-foot-high and the brand-new viewing area at the top offer similarly stunning sights.